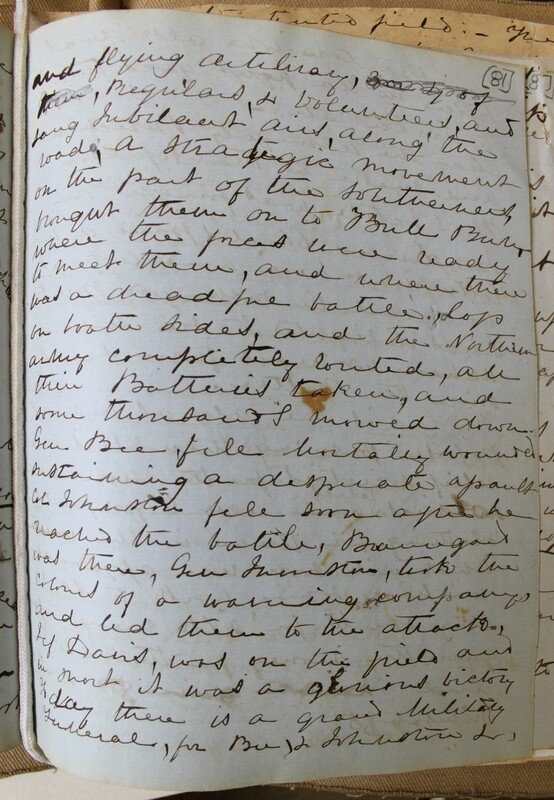 Item description: Entry, dated 26 July 1861, from the diary of Margaret Ann Meta Morris Grimball discussing the First Battle of Bull Run (First Manassas) and the formation of Confederate relief societies on the home front. Item citation: From the the Margaret Ann Meta Morris Grimball Diary #975-z, Southern Historical Collection, The Wilson Library, University of North Carolina at Chapel Hill. Papa left us for Buncombe on the 24, he went off in a furious annoyance at not being called for before half past eight so he quarreled with the hack man, I am glad he has gone, for his rigid ways became disagreeable. We did as well as we could for him, & I believe he was satisfied with his visit. – The Grand Northern Army left Washington, horse foot and flying artillery, Regulars, & Volunteers, and sang jubilant airs along the road. A strategic movement on the part of the Southerners brought them on to Bull Run, where the forces were ready to meet them, and where there was a dreadful battle. Loss on both sides and the Northern Army completely routed, all their Batteries taken and some thousands mowed down. Gen. Bee fell Mortally wounded, sustaining a desperate assault. Col. Johnston fell soon after he reached the battle, Bauregard was there, Gen. Johnston took the colors of a wavering Company, and led them to the attack. Jeff Davis was on the field, and in short it was a glorious victory. This battle was fought on Sunday. – Charles paid a nice little visit here and looked so well and in such good spirits I was delighted to see him, – We have not heard from Lewis since the battle. The ladies are all as busy as possible forming themselves into relief societies for the wounded soldiers, and also to prepare clothing for them in the winter, which will soon now approach. We have some work to do, 10 long shirts for sick men. Papa gave the money for the cloth and Charlotte gave $10 & Mr Grimball $5. Margaret Ann “Meta” Morris Grimball was born in 1810. She was a descendent of Lewis Morris, a signer of the Declaration of Independence. In 1830, she married John Berkley Grimball (1800-1892), who owned a rice plantation near Adam’s Run, South Carolina. They had nine children, whom they brought up at the plantation and in Charleston. During the Civil War, the family sought safety in Spartanburg, South Carolina. The plantation was confiscated by federal troops but returned to the family in 1866. The Grimballs were unable to continue mortgage payments and lost the house in 1870. Meta died in 1881. 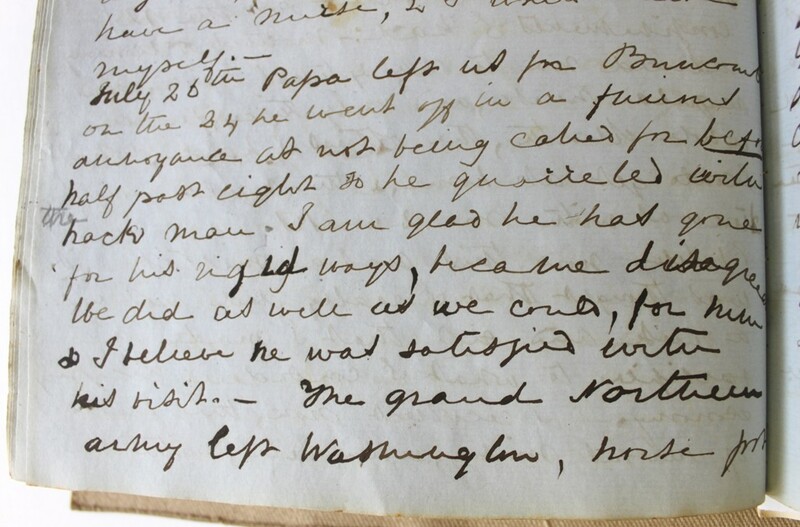 Meta kept a diary before, during, and immediately after the Civil War. In it she records the major events of the day and their effect on her family’s life. Grimball juxtaposes common domestic concerns with larger issues related to the Civil War, including slavery, personal safety, and religion. The journal closes with an entry describing some of the family’s hopeful plans for survival. 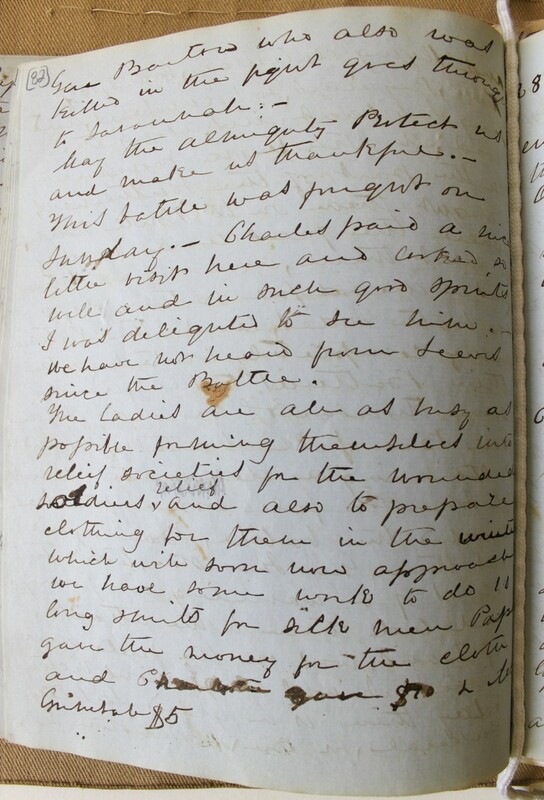 This entry was posted in Southern Historical Collection and tagged Charleston, diaries, First Battle of Bull Run, First Battle of Manassas, Meta Morris Grimball, relief societies, South Carolina, women. Bookmark the permalink.